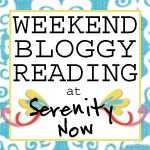 Serenity Now: Is That Your Final Answer? So I've got a whole lot going on in this post today. Hope that's okay. I'd do a double post, but I have to go to the dentist this morning to get tortured have a check-up. Plus, I always wonder what goes on when I leave T home with the girls. I imagine it involves a lot of cartoons, crackers, rough housing, and an unloaded dishwasher. So I have a lot on my mind. First, I have an exciting announcement! Southern Living's blog division of their site chose moi (??!) as their Southern Living Mama Blogger of the Week. I was so excited when I got an email from them saying they wanted to feature this post from Wednesday, dedicated to my aversion to running. See, people, sometimes laziness does pay off! I want to thank "Bella" at Southern Somedays for sending my name over to Southern Living. I really really appreciate you thinking of me! If you have a chance today, please go check out Southern Living's website. We all know that the magazine is fabulous, and the website sure doesn't disappoint! They have everything from recipes to before & after decorating shots, to a feature on Southern Weddings. Best of all, they showcase different blogs under the Healthy Living section. Fun stuff! I decided that since my post being featured over there was about running, perhaps I ought to follow up to that post and this first one that started the whole mess. So many of you readers commented on the posts to encourage me, so I feel I owe some sort of answer. Plus, I am seriously terrified of my sister...if I don't decide soon, she will beat me up. Really. 1. My brother-in-law-to-be, Sam, commented on my last post at great peril to himself. He is a big, hulking, Army Black Hawk helicopter pilot, but even he appears to be phased by Mr. Hyde my sister. She can turn on scary like a light switch. I figure I owe him this much. 2. I had to buy a new bathing suit this week. It was a terrifying experience. Natalie almost opened the dressing room door on me. I think the poor dressing room attendant would have suffered from post-traumatic stress disorder had she witnessed such an event. 3. Need I reiterate the terror my sister (who is younger than me by three years, might I add) induces? Even though she strikes fear into my heart, she can be pretty nice when she wants. She offered to send me a training thing for my iPod. The person tells you when to walk and when to run. I like this because the person can't see me and laugh at me. If they do, I can mute it. 5. Get to know some new people. Thus far, everyone who has offered to run with me (or run while I slobber and crawl a mile behind them) is on a completely different fitness level from me. Maybe while I am slobbering and crawling, I'll meet another girl whose evil sister lured her into entrapment. 6. Disney. I love it there. Whether or not it will still be "The Happiest Place on Earth" when I'm through with it this time (if I even make it!) should be left unsaid. Blair: Just run it, you wuss. Me: Only if you run it too, and wear a pink shirt. Boo ya! Blair: That's fine with me. I can be a princess. For 13.1 miles at least. Blair: Like a regular looking pink shirt? I'm down. Me: No, no. You're supposed to say "Hell no I won't wear a pink shirt that's so gay don't even think about it." Blair: Bummer how that worked out, huh? Me: (still thinking of an excuse) Maybe I could drive a golf cart or something. Blair: As a health and kineselogy major, I would have to advise you to do it. Once you hit twenty-faux, things start to go downhill. Well, there you have it, folks. Finding the cash to get to Florida after paying for preschool and Christmas (and inside Disney's pearly gates!) should be a challenge matching this training. We'll see. If you're new to my blog, I thought I'd offer a few of my favorite posts. 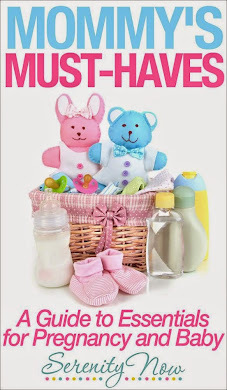 I categorized them in case you're one of those poor saps who wants kids but is too scared to learn the awful truth. You can always just peruse my labels on the sidebar for more posts, but these were some I thought were passable. If you're new, I hope you enjoy them. If you're "old" I hope you'll keep coming back for more! I am so thankful for all of the people who take the time to read and comment on what I've written. That you all find anything I have to say interesting still blows my mind. You are adding some Serenity to my life. 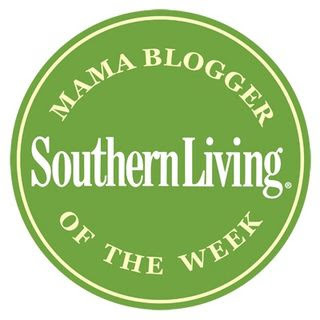 Congratulations on being Southern Living's Mama Blogger of the Week Amanda! I'm so excited for you. I must also extend my congrats on your decision to train. I'm very impressed. It'd take more than a guy wearing a pink shirt to convince me to do so. I'd be asking for something shiny & sparkly to go with the oxygen mask I'd need at the finish line (or at least a third of the way through). Your blog is among my favorites. I sure wish blogging was around when my kids were young. I might have more hair! Sheesh! Now you've got me feeling all "old" and stuff!! I'm so excited for you!! Yay for the Southern Living Blogger feature!! Girl, you are absolutely hilar!! First off, congrats on the Southern Living Mama Blogger Award! That is too awesome....I love love love Southern Living. My SIL sent me a subscription so I don't feel quite so much like a yankee living up here in PA, and I'm always borrowing recipes from their website! Give me an "A"! (a) Give me and "M" (m)....this is me being a cheerleader. Picture me jumping up and down and doing the arm movements for the letters too! You will be awesome...can't wait to follow your journey! p.s. When you've done it...I will do the entire cheer...in a cheerleader outfit and post it on my blog for you! Congrats on the Southern Award! As far as jogging/running. I just can't get into any jostling activity that makes parts of me flap around. I could put an eye out or something. Good luck! Congratulations on your Southern Living feature! How exciting! Stopping by from SITS roll call to say hello! I have been a loyal Southern Living reader for eons! Good for you. That is very exciting news! Congrats on having your post featured!!! Do you know what that Ipod thing your sister is sending you that tells you when to walk and run is called? I could really use that!